FYI 2 jars of pot were found in Sam's home not just a few joints. Good kids and got some passion for the U! I'm so sorry to hear about your wife!! 2 joints or 2 truckloads.. doesn't matter. Shouldn't be illegal. And why was his house searched? We should shut up and go fill a script for oxycodone instead. Much safer. My guess is Weldon will be the starter to open the season. Isn't jack or rosier the odds on favorite? With perry the popular choice (hope)? I'd say Rosier or Perry are the favorite. Google is scary man. It knows the books Im reading. I type in one letter and it knows whatever thing Im looking up in a book. I make no judgements just reported the " facts" where some of you stand astound me on illegal drugs. As a goody 2 shoes I have never been drunk nor used illegal drugs, have not had a speeding ticket nor injured anyone in any way and married 55 years never cheated on my wife. Peace to all. Give The Herb 2 more db's, 2 to 3 wr's, 1 rb, 1 dt, at least 1 more o-lineman all of quality and I The Herb shall be satisfied. Even if we have to drop some dead weight like Henly, Choc, bus, and Mayes. I like some of the recruits the Canes are chasing. Just like last year, the Canes are going after very good players with high ceilings. It does not appear that the Canes are recruiting any reaches or projects, and CMR appears to drop questionable recruits for athletic performance or potential issues, not for other issues. Like last year, it seems that CMR is committed to quality in this class, and would prefer to take a smaller class rather than take players who are reaches. CMR can fill any gaps with junior college or graduate transfers. But my guess is that they have a good chance to meet their goals for quality and quantity. Miami coaches didn't waste anytime getting after it on Thursday. The Hurricanes had assistants recruiting up and down the state of Florida along with representatives in Lousiana, Maryland and Georgia with the NCAA recruiting 'dead period' in the books and the 'contact period' now open. — Miami head coach Mark Richt and wide receivers coach Ron Dugans went in-home with Winter Park wide receiver Jordan Pouncey on Thursday InsideTheU was told by multiple people including Pouncey himself that the visit went well. The former Notre Dame commit even used the word 'surreal' to describe the meet and greet when asked what the conversations were like. While Miami continues to trend in the right direction for Pouncey, this is shaping up to be a Miami-Tennessee battle down the stretch. The Volunteers also sent an assistant coach in on Thursday and there's some buzz coming out of Knoxville that the SEC school is right in the thick of things. Pouncey will take an official visit to Coral Gables this weekend. He isn't expected to announce a decision until Feb. 1's National Signing Day, but don't be surprised if the Hurricanes try to push for a silent commitment on Sunday before he leaves campus. — Speaking of this weekend, don't expect too many surprises when it comes to the official visitors. InsideTheU was told late Thursday that Pouncey, Alabama junior college cornerback commit Jhavonte Dean, Miami Top247 defensive end commit D.J. Johnson, Miami four-star cornerback commit Trajan Bandy and Miami three-star wide receiver commit Evidence Njoku are the prospects expected to arrive on Friday. There's a chance that West Virginia three-star wide receiver commit Mike Harley could also show up, but right now that's not looking likely. Miami would love to flip Dean from the Crimson Tide, if possible, but the coaches also want to shore things up with Johnson this weekend who will be in South Florida for the first time with his parents. — There's been some smoke out there that Brunswick (Ga.) Glynn Academy three-star offensive tackle Zalontae Hillery might not be all that solid on his pledge to the Hurricanes with schools like Florida, N.C. State and Kentucky still in the conversation, but at least one person connected to his recruitment expects him to sign with Miami. The word coming out of Georgia is that Hillery's high school coaches want him to take all of five of his official visits, because they feel like Hillery committed to the Hurricanes at Richt's inaugural Paradise Camp without giving any other programs much of a chance. — Denton (Texas) Guyer three-star tight end Brian Polendey arrived in Coral Gables on Thursday and moved into his dorms. Miami loves Polendy's upside, but it appears that the coaches are still entertaining the idea of taking a second tight end in the class. One name to keep an eye on is Top100 tight end Josh Falo. The California native said two weeks ago at the Under Armour All-American Game that he wasn't planning to take an official visit to Miami, but InsideTheU has learned that he recently reached out to the Hurricanes. While Falo is certainly a name to know, there's also a strong possibility that UM elects to pass on a second tight end and tries to take two elite guys next cycle with 2018 Top100 tight end Brevin Jordan believed to be favoring the Hurricanes at the moment. — InsideTheU was first to report on Thursday that Miami has expressed some interest in South Broward three-star offensive tackle Jordon Carty. We have since learned that there's a chance he could take an official visit to Miami late in January although its unknown at the time where exactly he sits on the Hurricanes big board. Carty's high school coach said that his lineman recently received a high enough test score to qualify at most schools, but added that some academic work remains when it comes to coursework. The 6-7, 265-pound tackle is set to take an official visit to Mississippi State this weekend. He has already been to Oregon State. — There isn't much new information to relay when it comes to Amite (La.) High five-star wide receiver Devonta Smith and East St. Louis (Mo.) High Top50 wide receiver Jeff Thomas. Dugans saw Smith early Thursday and is expected to make his way out to the Midwest next week to sit down with Thomas. The latest intel suggests that Alabama still leads for Smith, but many think that Thomas will end up inking with the Hurricanes and apparently some people inside are already pushing him that way. — It was reported elsewhere that American Heritage Top247 offensive guard Tedarrell Slaton will take an official visit to Miami on Sunday after a basketball tournament on Saturday. We haven't been able to confirm this trip. We can however report that Hurricanes defensive line coach Craig Kuligowski did meet with Slaton on Thursday and we're told the two discussed the possibility of him playing defensive tackle at Miami, but the word out of Coral Gables right now is that Slaton isn't slated to visit this weekend. We'll monitor the situation over the next few days, but Florida remains the favorite in the recruitment. — Dillard three-star defensive tackle Jon Ford also got a visit from Kuligowski on Thursday. He will take an official visit to Kentucky next weekend, but at least two people at Dillard believe that he ultimately sticks with the Hurricanes and is just taking trips to other schools to see new places. That also appears to be the case with Carol City linebacker De'Andre Wilder. He met with defensive coordinator Manny Diaz on Thursday and while he says he intends to take an official visit to Utah this weekend some think that he doesn't make it out to the Pac-12 school. — Miami offensive coordinator Thomas Brown was at Hyattsville (Md.) DeMatha Catholic on Thursday to checkup on Top247 running back Anthony McFarland Jr. and his family. The Hurricanes continue to look like the favorite to land the Under Armour All-American in advance of his Jan. 25 decision. The only hiccup for Miami might be if Florida hires Alabama analyst Mike Locksley. The former Maryland assistant has plenty of ties to the DMV and was apparently one of the main reasons why McFarland had the Crimson Tide initially on his short list of schools. — It's hard to get a read on where things stand with Miramar three-star cornerback Brian Edwards, but after our on-site conversation with him Thursday we feel as if his recruitment is a two team battle between Miami-Florida battle with Louisville also in the hunt to land his signature. Edwards seems to really like UF defensive coordinator Randy Shannon, but he also seems to have built a strong relationship with UM cornerbacks coach Mike Rumph. This one will likely come down to the official visits with a decision not expected to come until National Signing Day. We'll add that Edwards was wearing orange and green Miami gloves at a practice for the Dade-Broward Game on Thursday if that counts for anything. — Richt & Co. might have been out on the road, but the Hurricanes still managed to get some talent on campus for the basketball game against Notre Dame. 2018 Top247 defensive back Josh Jobe, 2018 Top247 wide receiver Mark Pope, 2018 Top247 defensive back Gilbert Frierson, 2018 Top247 wide receiver Daquris Wiggins and 2018 three-star cornerback DJ Ivey were all on hand for official visits. Miami continues to gain ground with Pope. Frankly, I don't see that kid ever starting at UM. Reminds me of Ryan Williams though, but the depth chart & time doesn't favor Him like it did Williams. Yeah Evan "I Shot The" Sherriffs, oh yeah I can see that stilskin standing in the pocket and getting bulldozed. Probably has a size 17 shoe size. I can see him tripping over his own feet to dodge the rush! Bye Bye Mario-how many SOFLA kids gonna want to go all the way out to Oregon? Glad Richt doesn't want reaches, I'm not happy sitting here 3 was before signing day with 1 wr. A lot of wing and a prayer going and maybes and nights. Don't like sitting here Again in this position hoping we have our IHOP skills working. We should be mostly set at this point not having to grind to finish, we should be here sitting waiting for a little icing on the cake. But he's still a big fat jerk. Size 17 shoe? Um yea that wasn't his foot he tripped over. So.. u think I've put on weight? I prefer the hard stuff. At least he's not tripping over his hairy feet. Epi is funny as hell!!! I can always expect a good laugh everyday from the fatso! Totally random. My wife just starts playing my favorite fiddle song on the violin out of nowhere. She plays a perfect Ashoken Farwell and Im like 10 years, where the hell did that come from? She says she learned it when she was 12. Blown away. Fran...Sorry to hear about your health challenges along with Jeanne. Take care, be blessed and be well. On another note...Some very funny stuff on the blog today. Literally made me LOL! U guys r giving me a complex! Did my wife put u up to this? UM @ Pitt @ 12 on SunSports. TonyCane...He looked horrible in last years Spring Game. Now has He made huge strides since then...IDK. And unless it's changed, He's at UM on a partial athletic scholarship...His GPA & test scores were high enough to secure a scholarship for the other half of His tuition. But honestly, if you're looking for a darkhorse in this upcoming QB battle, look out for Weldon. Under the radar is a fo sho Golden thing. How many of those types did Goldie take in 5 years and that is where we have been flying for the last 12 years or so. 2011-2012 Recruiting: Challenged because other HCs are saying your school is going to get major sanctions or the death penalty. Golden still gets a strong number of commitments, but not at the FSU level. 2013-2014 Recruiting: You're past the investigation, but now there are several years of on the field results to be used by other HCs in negative recruiting. So if you're Golden, do you settle for baseline three star players who have limited upside? Or do you take chance after chance on project players and hope that many of them blossom, and then within a couple of years your signing class basically matches that of FSU. It seems like a calculated risk which basically backfired, leaving Miami with some players that may not have been any better (if not worse) than the baseline 3-star players that he could have signed. As for Sherriffs, I thought it interesting that CMR was also recruiting him as well. Mike Harley is on campus no? Richt should have a film study of the Miami / WVa game and invite Harley to sit in attendance. Am I the only 'Spacer watching UM and PITT on TV? UM is winning 48 - 31 with about 13 minutes remaining in the second half. Coach L gets His 600th double_ _.
UM 13-4 on the season, 2-2 in the ACC. 8 teams in the ACC are 2-2 in the Conference...dog fight. Mike Harley tweeted himself suited up in Cane uniform. Jahvonte Dean is geared up too. Saw a pic where Banda,Diaz, & Rumph brought the RAB trophy to some recruits house. Just games! The ones that are sincere are verballed, the ones that want to put on a show wait till signing day. Hartley ain't going to WV. Speaking of trophies, remember this?! It also happened more recently, when a recruit's father did Alabama dirty. 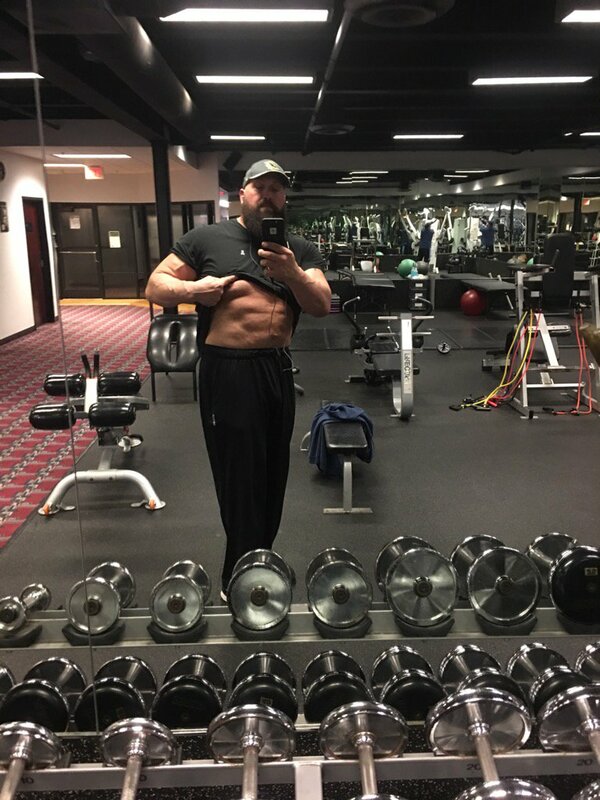 ...look at the shape that Miami resident and WWE superstar The Big Show has gotten into! Can anybody get a copy of his diet? I think NE is a fine team....but they get so many calls..and breaks.....Edelman pushed off in the open big as hell....no call....so obvious not funny. Thats why people hate NE....way too many calls when they need it...league loves them...as they did SF, Dallas the pretty boys... In college...we rarely get calls....same with Oakland...for years they never got calls. That tuck rule was the worst call ever....it was a fumble...but they always have to protect the brand ...the pretty boys that make them money. That is SAD!!! I can take losing when it happens....but man call it square. NFL is not called that way...nor is college....let them play!! !